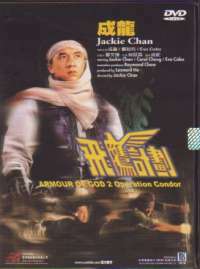 Armour of God 2: Operation Condor. 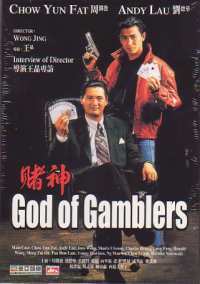 This film at the time was Jackie Chan's highest budgeted film in his career. Since then he has spent more on other films, but for me, few of those other films can match this one for its ingenuity in places, and for sheer grand scale. Like quite a few Jackie Chan films, Operation Condor isn't heavy in the plot department. In fact I think it could quite easily be summed up in a few lines. Nazi gold from World War 2 is hidden in a secret bunker in a desert and Jackie is hired to help locate the bunker and find the gold. However, he is not the only one after it, as one of the original guards of the bunker who managed to escape, is also on the trail with some hired guns. Essentially that is it for the plot. The majority of the film is following the group on their journey to locate the bunker, with glimpses of the bad guys along the way. 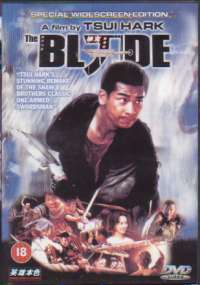 The finale is in the bunker after both groups have found it, which is where the majority of the film's fight scenes take place. There is no point of me going over the finer details of the plot, as they really are somewhat trivial for this review, and I really should leave somethings a mystery for you when you watch the film! Like practically every other Jackie Chan film, the main aspects that he tries to put across in his films are the comedy and the fight scenes. He does that in abundance here, but with Operation Condor, particularly at the end in the bunker, he puts these elements in a scale I have yet to see equalled by any other Jackie Chan film. The sets at the end are very big looking. I don't know whether they were built for the film or not, but things like those moving platforms that the bad guys try to get Jackie's head caught between, and the wind tunnel, are sets of such grandeur that it is clear Jackie wanted this film to be something quite extra special. I think he succeeded. The film takes us over many different landscapes, from city streets, to an Arab trading village, to desert and building ruins, to the highly industrial weapons and gold bunker, to the wind tunnel at the end. In each place we get to see Jackie Chan do his trade mark style fighting and agility, using everything and anything on set as a weapon: from a car door, to a hair pin, everything is, again, deadly in his hands. The fight scenes themselves are of an exceptionally high quality. After watching his recent Hollywood efforts, watching films like this makes you realise just how great he once was. Nowadays the comedy in his films seems to outweigh the fights, whereas in the past it was the other way round. For the fights, the takes are long, and shot from a distance so you get to see what is happening clearly, without any hyper-editting. Pretty much each one will amaze you somehow, wether it is because of how super fast and agile he is, or because of how original the scene is (the wind tunnel fight scene is the one I'm thinking of there!). The stunts are also a match to the fight scenes. Operation Condor was made in the era when Jackie Chan still risked his life for the sake of his films, and in several places in this film it very clearly shows. The one that strikes you straight away as being an incredibly dangerous stunt is the one I mentioned earlier where the bad guys try to get Jackie's head caught between two moving platforms. There doesn't appear to have been any special effects used here, those were real moving platforms, and from the way it looked, had Jackie put his head in the wrong position... well, I don't think there would have been any more Jackie. The other stunts which were very dangerous, you only really see how dangerous they were in the out-takes at the end. First off the spear thrown at the neck. In the out-takes you see the spear hitting the wall behind Jackie, about a foot or so away from his neck. Then you see Jackie complaining that it wasn't close enough, indicating he wants it literally an inch from his neck! That shows tremendous trust in his stunt team! Then there is the fight on top of that metal cylinder thing. Jackie does a forward roll right to the edge, with a big drop down, and fights two guys at once. Again, that is a real drop down, no special effects. When you see him moving away from the edge in the out-takes, you know that he still must find it quite scary. Lastly, for this review, there is the stunt which did almost kill him. Jumping from a curtain to a hanging chain, the chain gives to much, and he goes crashing down onto the ground below. If I remember right, this was the stunt that fractured his skull, or was that his stunt in the first Armour of God? I can't remember, regardless, he was seriously injured in this one. Everything about this film is brilliant in my opinion, or at least everything that matters. Those being mainly the fights and the comedy. The sets add to the film's appeal no end as well, and overall the entire film comes together as a winning combination. If I had to criticise it for something, I would say that it is maybe a little slow in getting going, but that is it for complaints. If you don't own or have never seen Armour of God 2: Operation Condor, find it somewhere and buy it. Just make sure it is not a dubbed version!